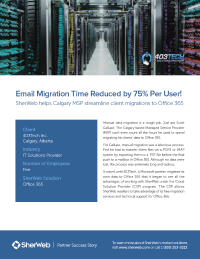 Tech Email Migration Time Reduced by 75% Per User! For a look at why many organizations are making the move to Office 365 and to read about their experiences, download this guide. Migrating to Office 365 can be a laborious process, but with the right help it doesn’t have to be. Having an email migration plan is vital for any Managed Service Provider. SherWeb’s Cloud Solution Provider (CSP) program can help your organization achieve an effective data migration procedure.